Five years ago, on Charlie Ryan’s second birthday, a big lump mysteriously formed on the side of his abdomen. At the emergency room his parents took him to, doctors suggested the lump was a hernia caused by some unknown trauma, and referred the family to a surgeon. The surgeon told them it was a benign tumor, and sent them home. Charlie already had a host of medical issues. He’d been born with an abnormally large head and other features of autism, including being nonverbal. Now this. Two years later, after visits to multiple doctors and the nine months it took for his genetic test to be analyzed, her hunch proved right. Charlie has a mutation in PTEN. Ryan immediately faxed the results to Charis Eng, a PTEN expert at the Cleveland Clinic in Ohio, whose name she had come across in her research. A few months later, the family made their first trip from their home in Tulsa, Oklahoma, to see Eng and her colleague, autism expert Thomas Frazier. Together, Eng and Frazier have treated more than two dozen children like Charlie — who all have PTEN mutations, autism and large heads. In Eng, Ryan finally found someone who understood Charlie’s condition. “It’s like going to the person who has all the knowledge in the world, and you can ask her any question,” Ryan says of Eng. Eng was first and foremost a cancer geneticist, and stumbled upon PTEN-linked autism through her work in that field. In 1997, she discovered the genetic root of Cowden syndrome, a rare condition characterized by tumor-like growths and a high lifetime risk of many cancers. Following people with the syndrome, as well as their unaffected family members, she noticed that a few relatives of people with Cowden syndrome have an autism diagnosis. She thought little of it; it was probably a coincidence. But then Eng noticed a few more children with autism in the families. And then a few more. “We started going, ‘Huh, how come there’s all this autism in the family members?’” she recalls. Cancer link: The mutation responsible for Charlie Ryan’s autism, in the PTEN gene, can also lead to cancers. To Eng, it was perfectly plausible that a mutation in the gene could lead to autism as well as to the many cancers of Cowden syndrome. Cancer arises when PTEN mutations release their brake on cell growth and proliferation, and cells grow out of control. When PTEN mutations cause an overgrowth of nerve fibers in the brain, Eng reasoned, they might instead lead to autism. The Journal of Medical Genetics ultimately published the study in 2005. Other groups soon confirmed the findings, and today the subtype of autism with PTEN mutations and macrocephaly — called PTEN-ASD — is estimated to represent up to 2 percent of all autism cases. The unexpected connection between cancer and autism isn’t limited to PTEN. In the past decade, many cellular pathways involved in cancer have been found to overlap with those implicated in autism, and dozens of genes have been linked to both. The findings have sparked investigations into whether autism treatments can piggyback off of approved cancer drugs that target specific genes. They also raise concerns that Charlie and other children with autism who have mutations in known cancer genes might be at increased risk for developing malignancies. So far, scientists have no concrete answers to address this worry. “We’ve barely scratched the surface,” says Eng. Most researchers agree that a combination of genetics and environmental factors lead to autism. Hundreds of genes are involved in autism, though only a fraction of these are strong candidates for the condition. Mutations are typically categorized as either ‘germline,’ meaning that someone is born with the mutation and carries it in nearly every cell of the body, or ‘somatic,’ meaning that the mutation occurs after birth and affects only a subset of the body’s cells. Cancer is usually a disease of aging, caused by somatic mutations; autism, a developmental condition, is usually linked to germline glitches. So it was a surprise when autism studies started picking out genes in pathways typically associated with cancer. 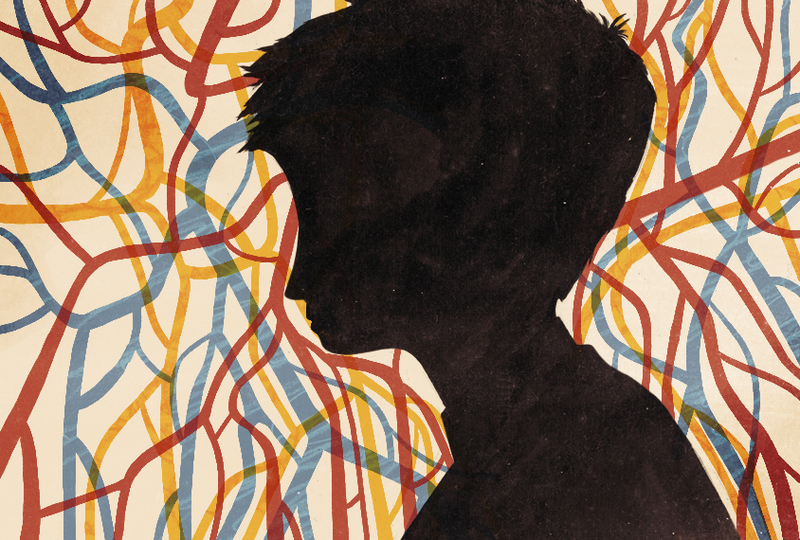 In several instances, the crossover emerged in much the same way it did with Cowden syndrome — with scientists noticing autism traits in people they were treating for other conditions. That’s what happened with tuberous sclerosis complex (TSC), a rare condition caused by mutations in TSC1 or TSC2. Both genes are located downstream from PTEN on a pathway known as mTOR (for mammalian target of rapamycin). In people with this condition, benign tumors grow in the brain and other organs, causing seizures, lung and kidney disease and other health problems, and occasionally turn malignant. Around 20 years ago, as autism diagnoses started to rise, clinicians began to recognize that autism was strikingly common among people with TSC. Today, up to half of people with TSC are estimated to have autism. Something similar also happened with RASopathies, a group of five disorders characterized by developmental issues, tumors and skin discoloration. Katherine Rauen, chief of genomic medicine at the University of California, Davis, identified mutations in the RAS-MAPK pathway, a well-studied cancer pathway, as the cause of RASopathies. Around 15 years ago, Rauen began to notice that many people with RASopathies are diagnosed with autism or have autism-like features. “When you see rare syndromes, and you see a lot of them, you start picking out patterns,” she says. In 2013, Rauen and her colleagues reported that 27 percent of people with RASopathies meet the criteria for autism. 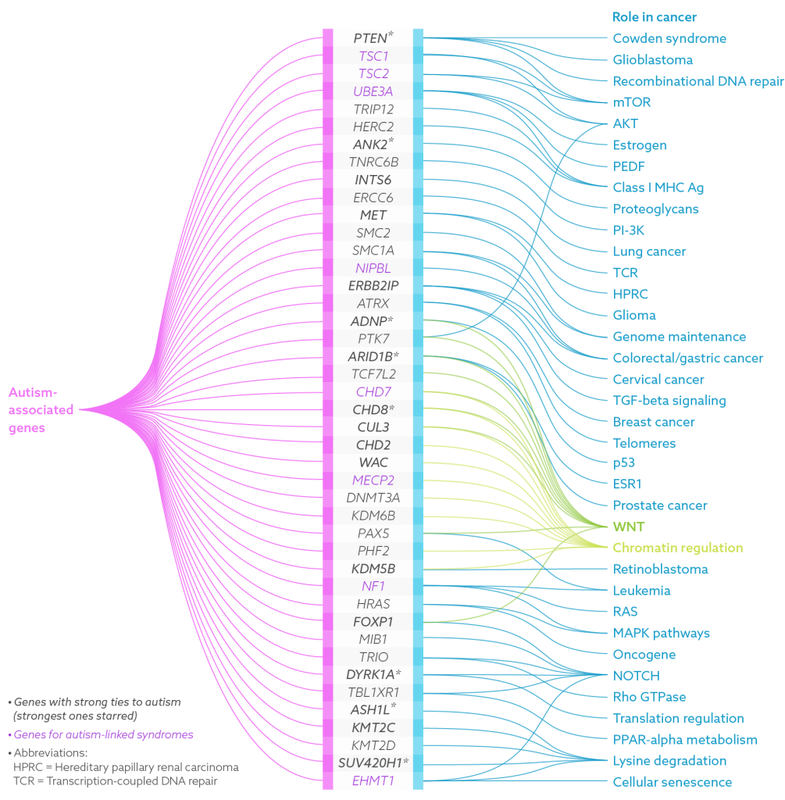 Other researchers hit upon the cancer connection directly, through deep dives into the genome. Geneticist Evan Eichler and his collaborators are sequencing the DNA of tens of thousands of children with autism as well as their unaffected family members to show that genetic mutations underlie autism. Among the first genes that popped up in their quest was CHD8, a gene that is involved in arranging DNA into tightly packed chromosomes. CHD8 also interacts with the WNT signaling pathway, which translates messages from outside cells into changes in gene expression, and has strong cancer ties. Eichler and his colleagues found that spontaneous, or de novo, mutations in CHD8 seem to cause a distinct subtype of autism with specific physical traits. When they looked at children with CHD8 mutations and autism, they noted that the children have broad foreheads, large heads, wide-set eyes and gastrointestinal issues. The growing number of cancer genes linked to autism piqued the curiosity of Janine LaSalle, an autism researcher at the University of California, Davis. In a study published in March, she and her colleagues reported that at least 43 genes thought to be involved in autism are also associated with cancer. Of those, 16 genes, including PTEN and CHD8, have strong autism links, and 8 others lead to autism-related conditions such as Rett syndrome and TSC. “Some themes jumped out” from the list, says LaSalle. She saw genes involved in chromatin —the DNA-protein complex that forms chromosomes — DNA repair and the transmission of signals that alter cell activity. Nine genes involved in the WNT pathway alone showed up; all are involved in genome maintenance, or fighting damaging assaults on DNA — and that’s a clue. The thinking is that early in brain development, errors in pathways that maintain the genome’s integrity may lead to autism. If the mistakes happen later in life, says LaSalle, they may occur in cell types prone to tumors. There may be more to it than timing and cell type. Eng and others are delving into the specific types of mutations, too, to see whether certain kinds of mutations contribute to autism, whereas others shift the balance toward cancer. When Eng first made the autism connection in 2005, she knew she’d hit upon a mystery she couldn’t solve alone. She needed to find the right partner. As it turns out, someone else was looking for a similar meeting of minds. Eng invited Frazier to attend her weekly lab meetings. After publishing on PTEN-ASD in 2005, Eng’s autism research had stalled, and she was eager to get it moving again. For his part, Frazier needed a mentor to guide him through genetics. When he showed up for Eng’s lab meetings, he initially had to look up words on his phone. Eng’s team would talk about the chemical modifications of DNA that alter gene expression, for example. “I had no idea what methylation was. The first year was really brutal like that,” he says, laughing. Frazier’s hard work paid off, and Eng was impressed with how deeply he came to understand genetics. “That’s really rare,” she says. The two now partner to explore what PTEN mutations do in people with autism, and hope to use their knowledge to find targeted treatments. In 2009, for instance, they began hunting for biological markers of autism, comparing people with PTEN-ASD and those who have autism but no PTEN mutation. To understand how mutations in PTEN cause autism features, they compared 17 children who have PTEN-ASD with three other groups: 16 children with autism and large heads, 38 with autism alone, and 14 controls. Compared with the other groups, children with PTEN-ASD had lower PTEN protein levels. Magnetic resonance imaging scans revealed that they had enlarged volumes of white matter, the fibers that brain cells use to communicate. The children also had poorer working memory and slower processing skills than the children in the other groups. Taken together, says Frazier, the findings indicate that low PTEN protein levels drive white matter abnormalities, which in turn impair cognition. The next step, says Frazier, will be to pin down the exact molecular effects of the loss of PTEN protein — an endeavor that other groups are working on as well. PTEN typically cycles between the cytoplasm (the fluid inside the cells) and the nucleus (the control center where the DNA is stored). The protein plays different roles in each location: In the nucleus, PTEN stabilizes DNA strands and plays some role in the cell cycle, whereas in the cytoplasm it plays multiple roles, including controlling cell proliferation and helping to suppress tumor activity. Eng’s lab created mice in which the PTEN protein clusters in the cytoplasm rather than in the nucleus, hoping to understand how the location of the protein influences brain physiology and behavior. Mice with most of the protein in the cytoplasm perform better in maze trials but display abnormal social behavior, traits that line up with those seen in people who have mild features of autism. Eng and Frazier haven’t thoroughly studied mice with PTEN primarily in the nucleus, but the mice appear to perform poorly on memory tasks and be socially withdrawn. Eng’s lab and others are also working to tease apart how PTEN mutations in autism and cancer differ. So far, they’ve found that PTEN mutations associated with autism tend to be missense mutations, in which one amino acid is replaced by another. That change drastically lowers, but does not halt, its key activity. A variety of mutations seen in cancers, by contrast, entirely disrupt PTEN, effectively halting its activity and releasing a brake that prevents tumors. Eng’s group is developing stem cell models that could pinpoint more specific differences. In cases of autism caused by mutations in other genes, it appears that the same mutation sometimes occurs in people with autism and those with cancer; the difference is in when and where in the body the mutation occurs. For example, the same germline mutation in a person with RASopathy-related autism might also be found in someone with bladder cancer — but only in the cells lining the bladder, and accompanied by mutations in other genes. Likewise, mutations of the TSC genes seem to have different effects in neurons than they do in other cells of the body, says Mustafa Sahin, director of the Translational Neuroscience Center at Boston Children’s Hospital. In cancer cells, the genes control cell growth and proliferation through the mTOR pathway, but in neurons, they appear to regulate connections between the cells. In mice missing one of the TSC genes, the axons — the long, thin part of nerve cells that conduct electrical impulses — “go to the wrong places in the brain,” Sahin says. Diffusion tensor imaging, which maps nerve fibers, also reveals abnormalities in the wiring of the corpus callosum — the bridge between the two hemispheres of the brain — and in language pathways in people with TSC. For now, however, the precise series of events that push development off track remain a mystery. “That’s really what we’re focusing on right now,” Sahin says. There are no drugs approved to treat autism’s core features, but the cancer link offers at least one clear possibility for leapfrogging forward. Billions of dollars devoted to cancer research have produced treatments that zero in on specific mutations — shutting down defective enzymes, for instance, or checking overactive proteins. 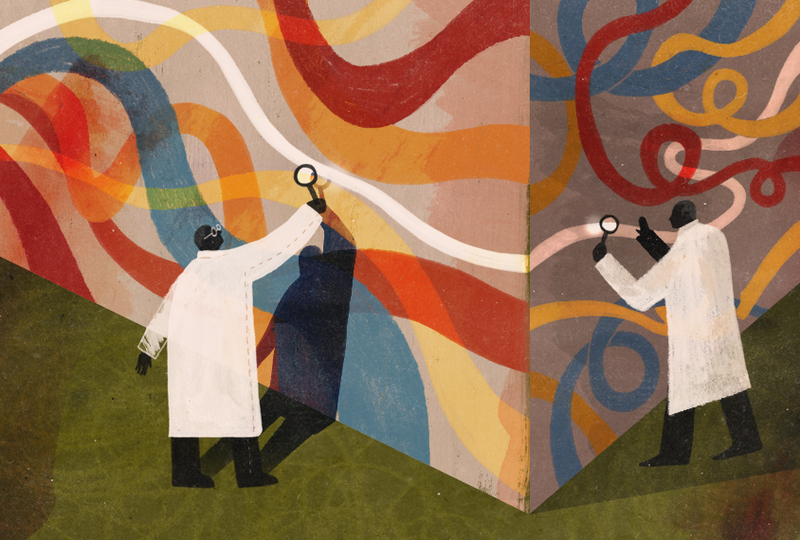 Autism researchers are looking to borrow from cancer’s medicine cabinet. Targeted therapies devised for cancer could become “incredibly effective” for the subtypes of autism that arise from a single mutation, says Luis Parada, director of the Brain Tumor Center at Memorial Sloan Kettering Cancer Center in New York. Parada has made mouse models for both cancer and autism, with the mice lacking genes including PTEN, TSC1, TSC2 and NFI, a gene linked to autism and pediatric cancers. In support of this hope, Sahin and others found in 2012 that mice missing TSC1 or TSC2 display autism-like behaviors, including atypical social interactions and repetitive behaviors. Rapamycin, a compound that blocks the mTOR pathway, halts these behavioral problems and seizures. Buoyed by these results, researchers then moved into clinical trials. In 2016, Sahin completed a three-month trial of 47 people with TSC, aged 6 to 21 years. One-third of the participants received a placebo, while the rest were given everolimus, a safer analog of rapamycin that is frequently used to treat pancreatic cancer. Neither the participants nor the clinicians knew who was receiving the drug. The researchers are still analyzing the results, but so far they do not see marked improvement in cognitive function in the everolimus group compared with the placebo group. The team hasn’t yet looked at autism features such as impaired social behavior and communication. Even so, Sahin is already thinking about next steps. In mice, he says, “we can rescue autistic-like behaviors if we start the treatment early, in the first days or weeks after birth, but often not if we start much later.” So a short-term treatment may not be enough to improve autism features in the age range tested. “We may have to redesign the trial to potentially look at the effects of everolimus in younger children,” he says. He emphasizes that although he is hopeful the drug will prove safe, and that the participants show at least a small improvement in brain function, he can’t predict the outcome of the trial. 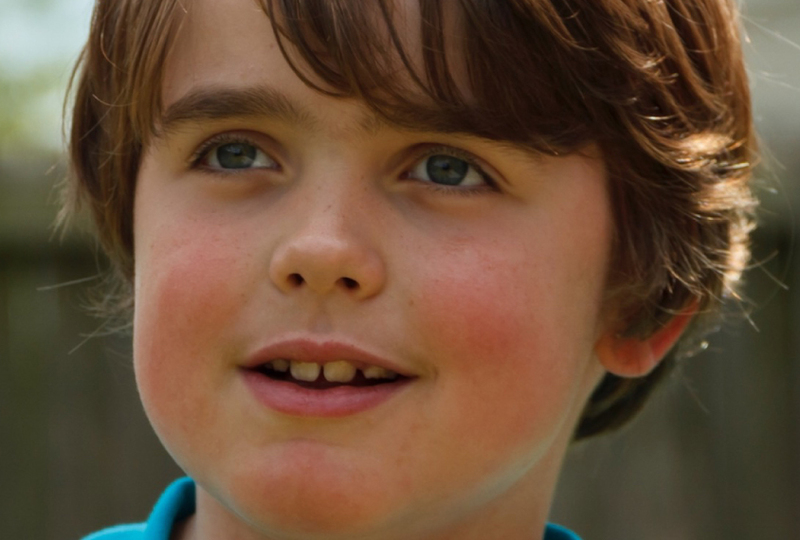 “In a wild, wild scenario, maybe their autism symptoms get better,” he says. Autumn Ryan hopes Charlie will participate in the trial, but she knows that’s not a given. Eng, ever the straight shooter, has told her that Charlie, who is now 7, may be too intellectually disabled to participate. Ryan is reassured to know that even if Charlie doesn’t take part in the trial, Eng and Frazier will continue to care for him, answering questions by phone or email, and seeing him once a year when the family visits the Cleveland Clinic. It’s an arduous trip that requires two plane rides and wears out both Charlie and his mom. Yet Ryan wouldn’t skip it. “I won’t travel all day to go on vacation with Charlie,” she says, “but I will to go to the Cleveland Clinic.” As Charlie gets older, these visits will involve more invasive tests to screen for cancer, such as colonoscopies beginning when he’s 9. Ryan worries about breast cancer, too: People with PTEN mutations have an 85 percent lifetime risk of developing that malignancy, and a drug Charlie is on to treat aggressiveness and hyperactivity, risperidone, is causing him to develop breasts. “All we can do is watch and wait,” she says. Ryan’s concerns are shared by other parents whose children are on the spectrum and have mutated cancer genes. They can’t help but worry: Are their children also at heightened risk for malignancies? In short, nobody knows for certain. A handful of studies indicate that the genetic overlap might not increase these individuals’ odds of developing cancer. In one analysis of the medical records of thousands of people with autism in California, cancer didn’t make the list of the conditions these individuals are most likely to develop. In fact, some evidence suggests that they might have an unusually low cancer risk. In another large-scale analysis, University of Iowa researchers compared the medical records of 1,837 people who have an autism diagnosis with those of 9,336 controls. They found that people with autism have a lifetime cancer risk of 1.3 percent versus 3.9 percent in the control group. There’s not enough evidence to say that mutations in cancer genes that contribute to autism prevent malignancies, Eng cautions. No study has specifically analyzed cancer risk in people with autism who have mutations linked to cancer pathways. If people with PTEN-ASD do develop cancer, there are several effective drugs that might be able to combat it — some of which, like rapamycin, are the very same therapies being tested for autism. Even if Eng is successful in finding targeted treatments for people with PTEN-ASD, however, she would be helping only a small fraction of people with autism. “That’s how precision therapy works,” she says. But given her years of experience in cancer biology, Eng inevitably thinks of the parallels: Just as cancer drugs developed for one type of cancer have turned out to be effective at fighting other types, perhaps a treatment for one subtype of autism will follow a similar arc. Click to see this data visualization at full size.